Ten kilometres west of the Kruger National Park is the Southern African Wildlife College (SAWC), offering conservation education, training and skills development programmes. 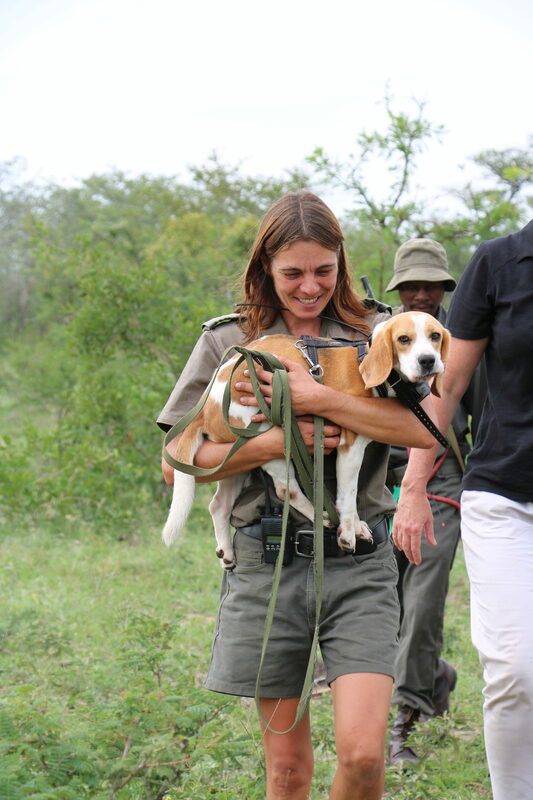 To help conserve biological diversity and protect threatened species in the greater Kruger National Park, one of their programmes includes training dogs in the battle against wildlife crimes. This is how they do it. The distinctive, dusty footprints on the boundary of the SAWC training ground in the greater Kruger National Park were about nine hours old. The rangers knew they had to act quickly. Within minutes, a sophisticated counter-poaching training exercise was in full swing. Soon a helicopter was en route to the site of the ‘incursion’, carrying Dog Master Johan van Straaten and the free-running pack dogs from the Southern African Wildlife College. The dogs, who are all in the advanced stages of training, followed the carefully laid tracks. Off lead, they’re quicker than any person, and in two hours, they had covered 20km! By following the dogs from the air, the idea is that the rangers are able to make up valuable time, leading support teams right to their targets. If this had been a real incursion, not a training exercise, it’s very likely the poachers would have been caught. These exercises show just how effective the pack hounds from the college are; they’ve even successfully followed about 12-hour-old spoor in ground temperatures of 39°C. “We can’t talk about operations as it could jeopardise the safety of all involved, but we can say that the dogs have already played a significant role in apprehending poachers and hunting equipment, even in the thickest of bush. Time and again, they’re proving their worth in the field,” says SAWC CEO, Theresa Sowry. “For the dogs, the reward is the work itself, but for those involved in counter-poaching, it’s a game changer,” agrees Van Straaten. Using their innate instincts, the dogs – a cross between English Foxhounds and American Blueticks – are trained from an early age to track people. They are also trained to track in a pack, unlike some breeds that are more suited to solitary tracking with a single handler. Remarkably, they have no problem ignoring anything else in the field – from lions to impala – as they run through the bush at incredible speeds, making up valuable time in tracking down poachers. Keeping up with them presents its own challenges, but working with the dogs trained at the college, Van Straaten and his team are developing innovative ways of monitoring them from the air. “Their noses are remarkable and so is their stamina; they can cover huge distances at high speed, without a handler in sight,” he explains. When they need to rest, new dogs are flown in, “but you can see how motivated they are when they track. They never deviate,” he proudly notes. While dogs have been used to combat wildlife crime for a number of years, the potential of pack dogs and apprehension dogs in counter-poaching is only just being recognised. The college’s K9 Unit was established in 2015, thanks to a catalytic three-year grant from the WWF Nedbank Green Trust. This grant supported the construction of kennels, the salary and housing for the dog handlers and the production of accredited training materials. In October 2017, a three-year grant was awarded to the SAWC by the International Fund for Animal Welfare (IFAW). This grant ensures that the highest possible standards are met when it comes to the welfare of dogs working in the service of wildlife conservation, and allows the college to build on their early successes in this specialised field. The college’s own dogs, as well as dogs in training, are well looked after in secure, modern kennels and their welfare is paramount. “They’re athletes working in challenging conditions and they expend huge amounts of energy during the course of their work,” says the college’s Dr Kevin Robertson, who is also a qualified veterinarian. This is why the college welcomes its latest partnership with Pack Leader Pet Products, a distributor of pet products, including Champion Petfoods’ brands ORIJEN and ACANA. These brands mirror the quantity, freshness and variety of meats that the dogs need to eat and that nourish them completely. “Our dogs are thriving on their current diet, as can be seen from their performance and their glossy coats,” says Robertson. Not all the college dogs are high-speed trackers. They also train and work with Beagles as well as Belgian Malinois, a slightly smaller, more agile German Shepherd Dog. The different breeds have highly specialised and complementary skills. “The hounds are good at tracking and pack work, while the Belgian Malinois are good all-rounders. They can apprehend a poacher, protect the handler, and search for evidence and illegal substances, sniffing out rhino horn, pangolin, drugs and other contraband,” says Van Straaten. The college also recently received a number of counter-poaching, free-tracking and apprehension dogs who have, with the support of the Ivan Carter Wildlife Conservation Alliance, been bred in Texas and trained for the college by accomplished and well-known houndsman, Joe Braman, and his staff. As a higher education and training institute, the college’s real-world, hands-on experience with its growing K9 Unit enables it to support the work of field rangers and wildlife law enforcement officers working with dogs across Africa.